He calls himself the "Piano Extremist" though no one knows his real name. He disguises himself with ski masks and combat gear. But though he is dressed up for a fight, this young man has for months now been performing lyrical recitals on old uprights for Kiev's Maidanites. 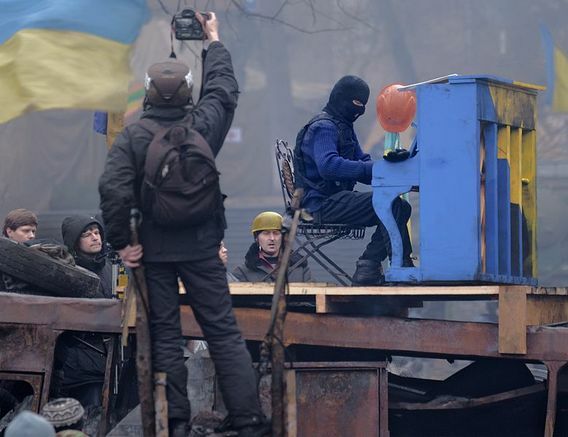 Although impromptu performances have become popular during the protests, this mysterious pianist has become something of a musician laureate for Euromaidan. He has played in the battle zone of Independence Square, on trailers coursing the ragged barricades around the city, and on the roof of a burned out bus of the "Berkut" -- Ukraine's feared paramilitary militia. The only thing he'll say about himself is that he's in his 20s and studied at a music college in western Ukraine. "My music shows that the people here are normal, educated people," he told Reuters. His moniker refers to the use of the term "extremist" by Interior Minister Vitali Zakharchenko to describe anti-government protestors. There are photos of him with sheet music stuck into his flak jacket. He favours the music of Italian composer, Ludovico Einaudi who is best known for his score for the movie Dr. Zhivago. He wears a silver ring on his wedding finger. KMDA is Kiev's City Hall, which became a rebel HQ in December until the occupiers vacated this and other government buildings in a conciliatory move on February 16th. In this recital a beer in a plastic up sits atop the piano while he gently feels out the keys through a ski mask, gloves and fatigues. He nods to the young girl to signal when to turn the page. This footage (below) was taken at a dimly lit Ukrainian House on January 26th. Ukrainian House is Kiev's most prestigious Convention Centre, right on European Square, 250 metres from Independence Square. Earlier that day, anti-government protestors had fire-bombed and taken over the building that police had been using as a stronghold. After two days, the Ukrainian parliament offered concessions and repealed anti-protest laws, only to resort to a brutal crackdown on the demonstrators two weeks later. The "piano extremist" has exchanged his ski mask for a motorcycle helmet. As he plays Einaudi's "Divenire" the camera pans around to show a woman sitting perched next to him, the Ukrainian national flag, a few people quietly scattered among the theatre style seats. Normally this place is host to prestigious trade fairs, award-winning exhibitions and fancy banquets. Earlier that day it had been a war zone. But on this Sunday evening, just one among Kiev's troubled calendar, it's a handful of listeners, a flashlight and this guy -- reminding us all of the things worth fighting for.